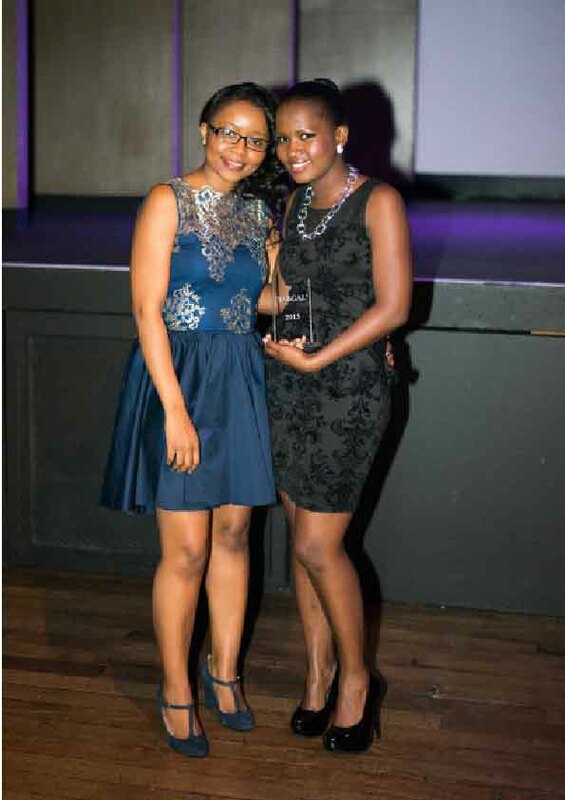 The Fabulous Woman Awards are FG Foundation’s initiative founded by Pontsho Manzi, the proud winner of The 2014 DTI Premier Business Awards Young Entrepreneur and Play Your Part Awards for her work with young women and girls of South Africa and as a young business woman. The awards are aimed at honouring SA women and girls who have done sterling in the empowerment and advancement of women and are the embodiment of ethical womanhood in South Africa. 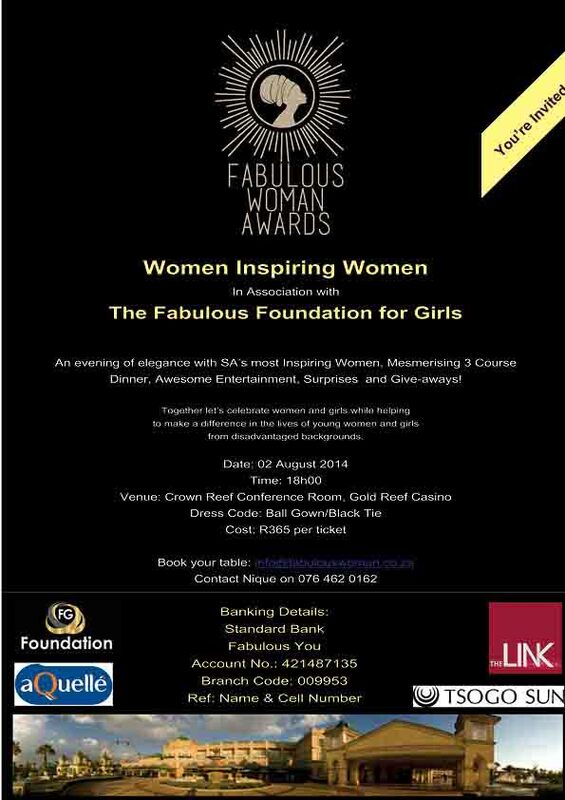 These are the first ever awards in SA that recognise both women and girls. The awards recognise the ethical values that are embodied in the campaign for women upliftment and empowerment, and women unity. The awards are aimed at engendering a spirit of sisterhood and cross generational bonding for all women of South Africa. 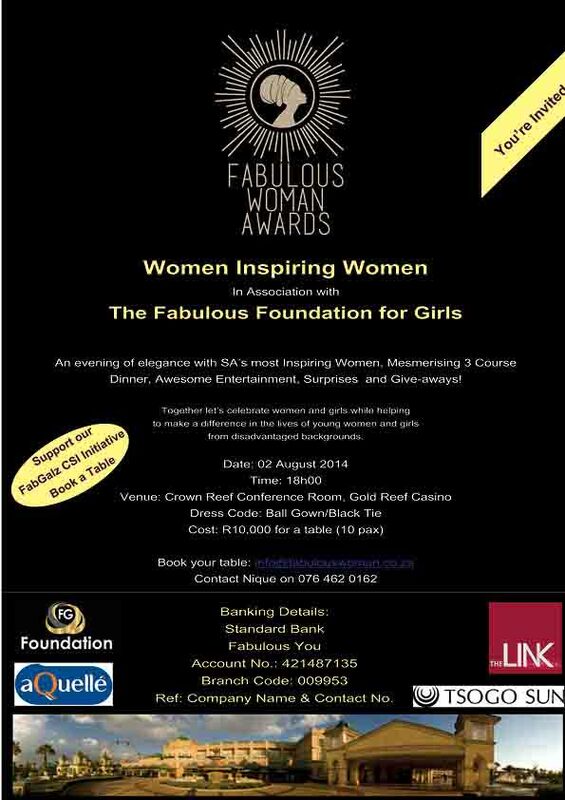 As a non-profit organisation, our aim is to uplift and empower young women of South Africa through education initiatives and exposure to various careers of their choice throughout South Africa and your involvement will assist The Fabulous Girls Foundation by ensuring that we get as many young girls from disadvantaged backgrounds as possible on a sponsored basis at the awards. The bigger vision of the awards and gala dinner is to give these young women access to our guests in a relaxed setting for possible mentorship access opportunities and/or sisterly love from women who have “made-it” in their chosen careers. The success of the inaugural awards in 2013 held at The Venue in Melrose Arch and the difference the awards have made in the lives of young women and girls who were recognised has prompted Pontsho to grow the Fabulous Woman Awards brand to be a premier annual event for South African women and further entrench the values espoused by Fabulous Woman magazine. Support this initiative by booking a seat or buying a corporate table.